Kids love this EASY Christmas playdough that takes just minutes to make! Get recipes for chocolate mint, candy cane, egg nog, and Christmas tree play dough. I wanted a fun hands-on Christmas activity to do with my kids, so I came up with the idea of creating some Christmas playdough! 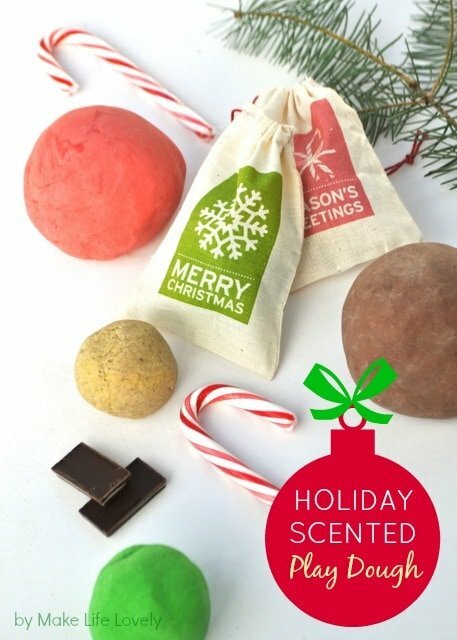 I asked my kids to tell me their favorite tastes and smells of Christmas so I could get ideas for some good scents for our DIY scented playdough. They came up with our Andes Mint Chocolate Cookies (the BEST Christmas cookies I make every single year), candy canes, and the smell of our Christmas tree. I came up with eggnog, because I just LOVE it! Off to the kitchen I went to turn our favorite scents of Christmas into Christmas playdough for the kids. I started with the basic play dough recipe that I always use. Since I wanted four different batches of scented playdough, I doubled the recipe. I separated the finished play dough into four balls then added the different scents and colors to each ball. I’m sharing the scented play dough recipe below for one batch. If you are making all four Christmas playdough scents, then I recommend doubling the recipe, and halfing each batch. The scent additions that I am sharing are for one whole batch. If you are splitting up each batch, like I did, then half the scents that are listed below. Best of all, this is a no-cook 4 minute scented playdough DIY, so it is really fast and super easy to make! You can even mix it all up in your Kitchen Aid using the dough hook (like I do), and avoid the stirring with a spoon. Couldn’t be easier! Step 1. Mix the first 4 ingredients in a mixing bowl. The Kitchen Aid is an easy option- just use the dough hook! Step 2. Add the hot water and a few drops of glycerin (optional, but it gives the dough more shine). The kneading is what makes the stickiness go away, so don’t skip this part! You can also add some flour if it is still sticky. Step 3. Add your desired color and scents, and mix (or knead) well to mix it all in. Recipe adapted from here. Now for the fun part- adding the scents and colors! Just a reminder- I used half a recipe for each scent, but I will give you the proportions for making a regular batch of play dough for the above recipe. Just be sure to half the ingredients if you are making half one scent and half another scent! Although the play dough will smell good enough to eat, this play dough is NOT edible! Don’t let your kids eat it! This chocolate scented playdough with mint smells just like my favorite Andes Mint chocolate cookies, fresh out of the oven! Very chocolatey with a little hint of refreshing mint. ADD: 3 Tbsp. cocoa and 1 tsp. peppermint extract. You don’t need to add any color because the cocoa already gives it a lovely brown chocolate color! You could also use drops of peppermint essential oil in place of the peppermint extract if you wanted. ADD: 1 1/2 tsp. rum extract, 1 tsp. vanilla, 1 tsp. nutmeg, 1 tsp, cinnamon, 1 tsp. cloves, and a tiny tiny bit of yellow food color. The spices will give the play dough the speckled look of egg nog, which I love! This one was a little trickier, because I couldn’t think of any pine scented oils or spices. BUT, we have rosemary bushes that smell very similar to Christmas trees, so we used rosemary oil to scent it, and the kids loved the smell. ADD: 20 drops of rosemary essential oil (available in health food stores or online) and green food color. Update: Now that I use essential oils, I know that there are pine and fir essential oils that would be perfect for making Christmas tree play dough! Who doesn’t love the minty fresh smell of peppermint at Christmas time? ADD: 3 tsp. peppermint extract and red food color. I hope you enjoy these Christmas playdough recipes as much as we did! This scented playdough DIY was a fun and new Christmas activity than we usually do, and will definitely be one of our new Christmas traditions. If you keep this scented playdough in an airtight container, it should last for months. Christmas playdough also make great gifts for little ones to pass out to their friends, cousins, or neighbors. I had some cute little Christmas muslin bags that were perfect for packaging these up and giving away! Just be sure so seal them in a plastic bag first so they don’t dry out. Originally posted in December 2013, updated in December 2018. LOVE LOVE LOVE!!!! Thanks for sharing your awesomeness. Thanks so much Laura!! And thanks for putting this fun blog hop together!